Now the company is starting up the cruise line with the 224-passenger Ocean Diamond, which previously was known as Song of Flower, when it operated for Radisson (now Regent) Seven Seas Cruises, and Le Diamant, as part of the Compagnie du Ponant fleet. In late 2011, Ponant sold the ship to investors who transferred the ship to Quark Expeditions, which continues to use it for Antarctic voyages from November through March. The Ocean Diamond has an ice-strengthened hull, two stabilizers and its own Zodiac boats for shore excursions. The 109 staterooms and suites all have outside views, en-suite bathrooms and flat-screen TVs with DVD players. The ship also has a library with a large collection of polar books and DVDs, Internet access, a bar, massages, and a theater-style auditorium with state-of-the-art AV equipment. The voyages will include presentations by local experts. The company offers six 10-day circumnavigations of Iceland in June, July and August, priced from $1,367 triple occupancy and $2,050 double occupancy. (The ship has six triple-occupancy staterooms measuring about 200 square feet with two twin beds and one upper bed). Air and hotel packages also are available in combination with the cruises, which operate round-trip from Reykjavik, Iceland. 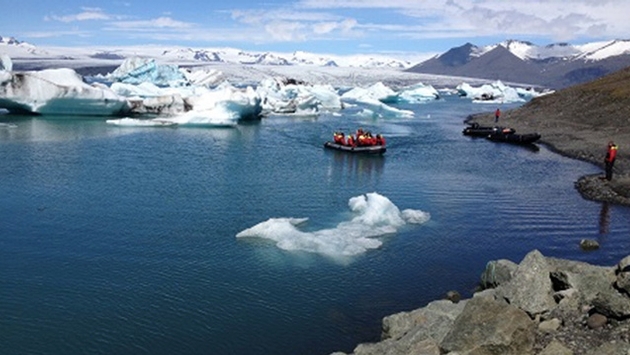 Another itinerary is the 12-day “Natural Wonders of Greenland and Iceland” cruise priced from $2,239 triple occupancy and $2,505 double occupancy. Sailing between Reykjavik and Kangerlussuaq, Greenland, these voyages operate Aug. 16-27 and Aug. 27-Sept. 7. In North America, marketing and reservations are handled by Emerging Destinations, which has offices in Atlanta and Boulder, Colo. For more information, call 503-964-8957 or click here.